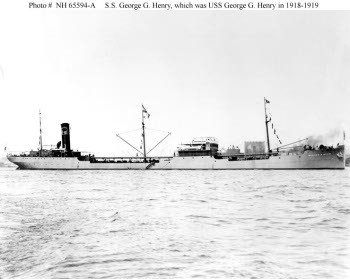 The Victoria was originally the George G. Henry, a civilian tanker built by Union Iron Works Company for Standard Oil in 1917. This obsolescent ship had seen service in the First World War, and was in Manila under charter to Standard-Vacuum Oil Company when war broke out in the Pacific. She escaped to Balikpapan and points farther south and refueled the ABDA forces throughout the Netherlands East Indies campaign. On 15 April 1942 she was taken over by the Navy, renamed Victoria, and served throughout the war, issuing over 2 million barrels of fuel oil by the time of the surrender.